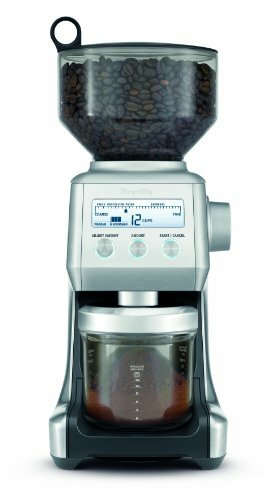 A comprehensive breville smart grinder review. Why the breville smart grinder is well worth the money. Pros and Cons included. Variety of Settings: 25 for Espresso, French Press, Drip, and Percolator coffee. 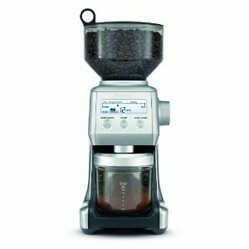 LCD Screen: A back-lit screen displaying grinder settings, number of cups/shots, and customized grind amount. Auto Dosing: Machine calibrates automatically with each adjusted dose. Safe Storage: Has bean hopper with locking system and air tight lid for easy storage and transfer of coffee jars. Extra Accessories: Includes portafilter cradles (2), burr cleaning brush, and grind container. The first thing you will notice when using the Breville Smart Grinder for the first time is the sound. Rather than a harsh grinder, the Breville Smart Grinder purrs like a luxury automobile. Paying for a top of the line quality grinder should result in a quality of life improvement. The sound factor alone helps separate the Breville Smart Grinder from the rest of the pack. I had tried Cuisinart's lower budget grinder in the past and was thoroughly impressed with the difference! This is simply the best all around grinder I have found that can deliver a variety of different grinds with ease. What you get in terms of options and performance is similar to grinders in the $400 range. With the push of a button you can seamlessly switch from espresso mode to drip, depending on what you are in the mood for. Changing coffee grounds is incredibly easy. The hopper locks and seals for an easy transfer of coffee beans. This was quite a selling point for me. I don't know how many times I spilled beans and made a mess with my old grinders. When I am half asleep early in the morning, the locking mechanism is a wonderful feature.The package even comes with a tiny brush that is very good at cleaning out grinder blades. The machine is built with quality materials and does not appear flimsy or cheap in any way. The blue back-lit screen is subtle and stylish. Best of all are the grinder blades which are substantial professional grade. They can handle any bean you throw in with ease. When the Breville Smart Grinder was delivered I was surprised at how small it is. It is certainly not as bulky as I expected and easily fits on my counter next to my toaster oven. Back when these custom grinders were first coming out they took up so much space it was almost a hassle to deal with. The Breville Smart Grinder can fit easily into a kitchen of any size. I have looked all over the web for a better price on a comparable product. I bought the Breville Smart Grinder on Amazon for around $199 a few months ago. This was a great price and has not disappointed so far! Numerous testimonials tell a similar story on Amazon. The only complaint I have read about is that the hopper is not absolutely air tight. I really have not noticed this, but just so you are aware this is one of the criticisms. Some people might raise their eyebrows at the price, but you cannot find a grinder with comparable features and track record for the same price. A comprehensive video of how it all works! Comments: What do You Think of the Breville Smart Grinder?